The Toledo Buddy Walk® has grown exponentially over the last 15 years and Renee Canfield, Executive Director of the Down Syndrome Association of Greater Toledo (DSAGT), hopes 2016 will be no exception. While Renee has been working with nonprofits for years, last year she experienced her first Buddy Walk®. In reflecting on last year’s event, Renee shared with us how much she enjoyed, “the way our families connected with each other. Usually it’s parents, siblings, grandparents, cousins, aunts, uncles, friends, friends of friends, teachers and more. I think that is what amazed me last year. The network of support reflected at the Buddy Walk®. 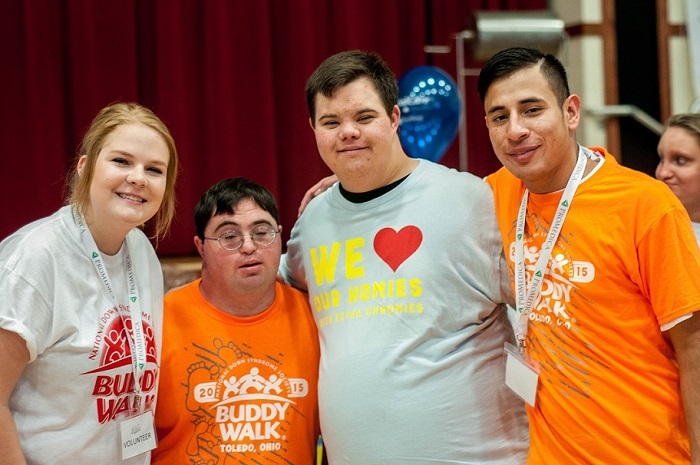 There’s nothing like it.” The team camaraderie is also a key part of the Toledo Buddy Walk® culture, with many groups bringing their own t-shirts and signs to celebrate their loved one with Down syndrome. Participants at this year’s walk are in for a fun-filled day of celebration. Music and dancing, carnival style games, a photo booth, free pizza provided by Little Caesars, mascots, and a few new surprises are in store for this year’s event. Additionally, DSAGT has secured a new location for the walk, which will be held at Fifth Third Field, home of the beloved Toledo Mud Hens! As in the past, there will also be a family resource fair with information about local services. With all of the different activities, there will be something for everyone to enjoy! DSAGT serves a wide region, including counties in Ohio and Michigan, and the walk is the perfect time for many families in both states to reunite. While families may not see each other throughout the year, Renee says, “Everyone always comes back for the Buddy Walk®.” Not only is this a time to reconnect with old friends, but it provides ample opportunities for new families to become connected as well. 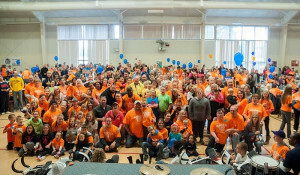 Renee says the walk is, “a time of celebration and togetherness for individuals in the community with Down syndrome and the people whose lives they touch.” With the shared feelings of togetherness, it is no surprise that families return year after year. 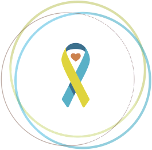 DSAGT has a goal of raising $50,000 for the 2016 Toledo Buddy Walk®. Funds raised from the walk help the organization provide valuable programming to its service area for activities like: teen and adult dances, outings and life skills programs, First Steps Baby Group, a Lending Library, and family support groups/outings. The walk helps keep programs local families count on running. To show your support for DSAGT and the 2016 Toledo Buddy Walk®, please visit their fundraising site at http://www.ds-stride.org/toledobuddywalk. To learn more about DSAGT, please visit http://www.dsagt.org.